Social media has changed the world around us; it has affected the way we communicate and how we connect with one another. It seems that people are always making social media updates, “liking” each other’s statuses, and uploading the latest pictures of themselves. Among the most evolving social media photo trends is the “selfie,” an image taken by an individual of themselves from a high-angled shot. The appeal of the famous “selfie” is due to how it makes a person appear thinner and more flattering. Plus, all social media outlets provide the added benefit of image filters to help wipe away wrinkles, fine lines, acne, and blemishes. 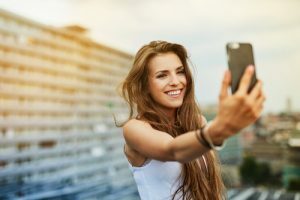 The “selfie” and photo filters have provided people with ideas on how to improve their overall facial image, and now, many people make themselves appear younger and more enhanced in real life through plastic surgery. Are “selfies” making people want to undergo cosmetic surgery? Make Your “Selfie” a Reality! Cosmetic surgery offers many different options for targeting facial aging and blemishes. Patients can undergo an individualized treatment that can help them restore a more youthful and smooth facial appearance. FX CO₂ laser: The FX CO₂ laser stimulates collagen growth by treating a fraction of the skin at a time to improve skin tone and texture. Injectable fillers: Fillers smooth fine lines and wrinkles by adding volume to the skin. Different injectable fillers are available that can be performed alone or combined to help restore youthfulness to the face. Chemical peels: Chemical solutions are applied to the face to smooth the tone and texture of the skin by removing damaged layers. Microdermabrasion: Gentle sanding of the skin is utilized to remove the thicker, uneven outer layer to treat light scarring, discoloration, sun damage, and stretch marks. Facelift surgery: Removal of excess skin and repositioning of the facial tissues smooths the skin while diminishing aging indicators such as fine lines, wrinkles, and creases. Brow lift: Sagging skin and weak muscles are addressed to improve the weak and tired look often found along the forehead and the eyebrows. Blepharoplasty: Drooping or puffy upper and/or lower eyelids are corrected by removing excess fat and repositioning the eyelid tissues. Rhinoplasty: Cosmetic or functional problems in the nose can be improved by reducing the size of the nose or nostrils, improving the nasal profile, and altering the shape of the nose. If you would like to make your “selfie” a reality, you might be a good candidate for one of our facial procedures. Schedule a consultation with Dr. Dubrow today! He is a board-certified plastic surgeon experienced in many treatment options. Contact us by calling (949) 515-4111 or by filling out our online contact form.